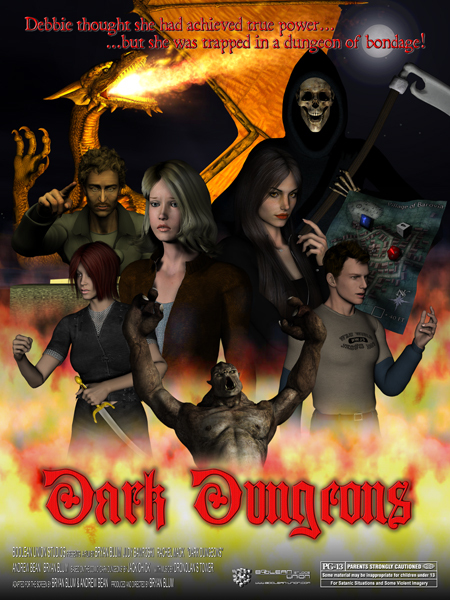 Dark Dungeons is an adaptation of a religious tract of the same name, written by Jack Chick in 1984. Like many of Chick's works, the tract has worked its way into popular culture and has become a target for both emulation and parody. The tract follows a teenager named Debbie who, in the course of playing the role-playing game Dark Dungeons, becomes a Satan worshipper and begins practicing black magic on her father. Meanwhile, her friend Marcie, devastated over the loss of her player character, commits suicide. Debbie finds the body and realizes the terrible effect the game has had on her friends, but is unable to stop playing. At the last minute, two Christians arrive, one after the other, to preach to her, ultimately leading to her conversion and her abandonment of Dark Dungeons. Dark Dungeons, of course, is a thinly veiled pastiche of the classic Dungeons and Dragons RPG, created in 1974 by the late Gary Gygax and now published by Wizards of the Coast. Older readers may remember the moral panic that mushroomed during the mid 1980s that blamed D&D and other role playing games, without much evidence, for a host of social problems, particularly teen suicide. Those leading the crusade argued that these games, and by implication fantasy literature in general, led innocent youths into Satanism. The “Dark Dungeons” tract comes directly out of this period and reflects many of these concerns. A quick survey of the Internet will turn up various parodies of the tract. Boolean Union Studios’ version plays the material relatively straight, because we think the inherently risible content speaks for itself. For a production timeline, please see the Project History page. Still images and production commentary can be found under Production Gallery. Copyright note: The copyright to the original "Dark Dungeons" tract and all artwork belongs to Jack Chick Publications. Boolean Union Studios is not affiliated with or endorsed by Jack Chick Publications. Other than the original portions of the adapted screenplay, Boolean Union Studios does not claim this material as our own. The Dark Dungeons animation will never be sold for profit and will remain free for anyone to view, just as the original tract is. Boolean Union Studios believe that our use of this material is free speech and falls under fair use guidelines. It also bears noting that others have produced works based on Chick publications not substantially different from what Boolean Union Studios is doing with Dark Dungeons: see "Hot Chicks". Dark Dungeons is also viewable in two parts on Youtube. Listen to Boolean Union's interview with Polymancer Studios about Dark Dungeons!